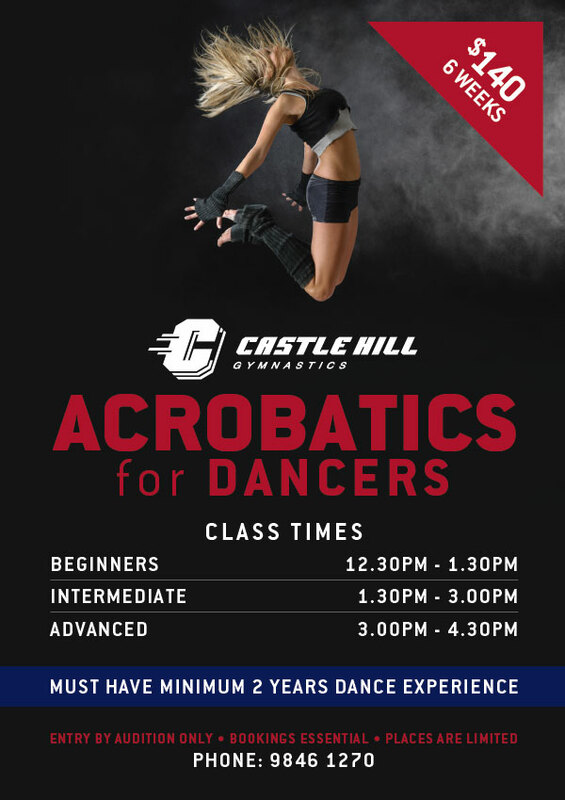 Acrobatics for Dancers offers the oppurtunity to develop the acrobatic skills now required to be competitive in your chosen dance genre. This program is designed to help assist your child in learning these skills in a safe and professional environment. All of our coaches are fully accredited and our Gymnastics Facility has the necessary equipment, floor space and trampolines needed to help your child learn the tumbling skills/drills they need to be able to do. Classes are offered to dancers with a preferred minimum of 2 years dance experience, and entry in to this program is by Audition Only. Auditions are held on the first Sunday of the program at 12:00pm. If successful, you are then welcome to join the program from that day. Based on the results from the audition, it may be necessary to direct those lacking skills to join our Beginners Recreation Program while they gain the skills needed for this program. There are 3 different levels you could be placed in based on your audition. We offer classes for Beginners, Intermediate and Advanced. To book an audition, please call 9846 1270.